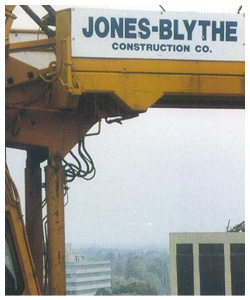 Jones-Blythe management and employees are committed to the principle of "All Occupational Injuries and Illnesses are Preventable." We believe that everyone's health and safety is an essential part of our business and that we all are responsible and accountable to effectively implement a safety program that will succeed in incident prevention. Our management and employees are committed to being an industry leader in health, safety and environmental practices, to maintaining a safe and healthy workplace and to protecting environmental quality. We believe excellence in HS&E practices is vital to the well being of all people everywhere and essential to all aspects of our global business. "Creating an environment where it is possible to be injury free every day." Our projects will be executed in a manner that maintains the health and safety of all those present at site including employees, contractors, and visitors and protects the environment. Regardless of position, each and every one of us is accountable for our safety and the safety and well being of others. It is our moral obligation to be safety leaders by identifying hazards, speaking up, controlling and taking necessary actions to eliminate hazards, up to and including the stoppage of work. We believe in treating each other with dignity and respect. We are all valued for not only what we do, but for who we are, and our contribution to the project's success. Work will be conducted in a manner that meets or exceeds all laws and regulations. Health and Safety management systems will be established and communicated through our Health and Safety Plans to implement the appropriate processes for the protection of all on site. A site specific safety plan is developed for each major construction site to ensure the mitigation of all potential hazards.